Are you a foodie? Who isn’t! But if you love trying new taste sensations, Virginia Beach is the place to be during of week of February 18 to 24. More than 90 eateries will be participating in the annual Virginia Beach Restaurant Week, where talented chefs showcase their culinary wizardry by offering specially priced meals. If you have a hankering for some fresh seafood, you’ll find an array of eatery choices, some of which afford a waterfront view. It will also be fun to try cuisine from far corners of the globe such as Greece, Cuba or Japan. You’ll definitely have a gastronomic experience to remember. Best of all, the prices won’t break the budget. Breakfasts start at $5, two-course lunches start at $10 and three-course dinners start at $20. 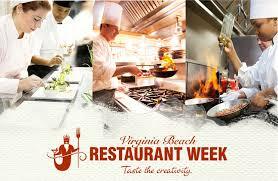 For a list of participating restaurants, visit the Virginia Beach Restaurant Week website. Speaking of food, do you like to eat while watching a movie? If so, you may want to plan to watch one of the latest movies at Cinema Café. Instead of snacking on popcorn or a hot dog, you can sit in a comfortable chair at a table and enjoy some real food like pizza or a gyro. The address is 1220 Fordham Drive. Winter camping in Virginia Beach has its special rewards, and our many hot deals make it irresistible. You’ll find the current promotions on our website. Don’t let the cold weather stop you from having a cozy getaway. Come enjoy outdoor recreation in the crisp air. By day, you can play in our Pocket Park, try your hand at our indoor Game Arcade, and engage in outdoor volleyball or basketball; and by night, you can savor hot chocolate by a warm campfire. Choose from one of our brand new Deluxe Patio RV sites, Deluxe Cabins with bathroom and linens, rustic Camping Cabins in the woods, or a traditional tent site. Enjoy our brand new Pocket Park filled with games and recreation for kids and adults. Learn more on our website.